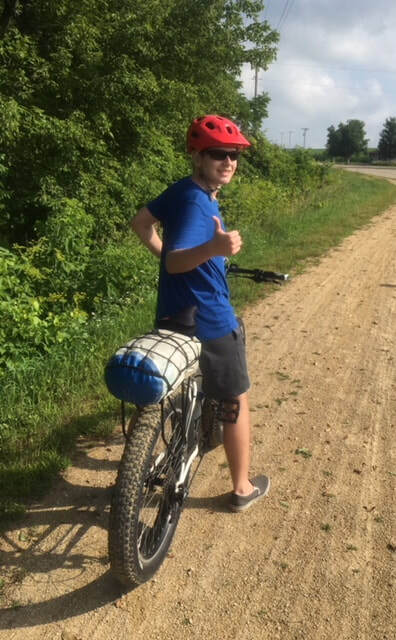 The Military Ridge Trail is a 40 mile multi-use Wisconsin trail that runs between Fitchburg and Dodgeville, connecting the towns of Fitchburg, Verona, Klevenville, Riley, Mount Horeb, Blue Mounds, Barneveld, Ridgeway, and Dodgeville. The east end of the trail connects users with 100s of miles of trail that extend into Madison and throughout Wisconsin. This beautiful trail traverses woods, wetlands, prairies, farmland, and small towns. The trail includes long stretches of lovely woods with tree canopy, interspersed with occasional vista openings, providing users relief from the hot summer sun. There is an observation platform adjacent to the trail for viewing wildlife and other natural features and many informational signs. Spectacular stretches of wetlands and prairies are studded with wild flowers and home to cranes, woodland and wetland birds, and much more. The trail has 37.5 miles of crushed limestone and 2.5 miles of blacktop (between Fitchburg and Verona) making this short stretch of trail usable for in-line skating. With a 2 to 5 percent grade this trail is ideal for users of many abilities. Users include hikers, bikers, runners, wheelchair users, in-line skaters, cross-country skiers, snowshoers, and snowmobilers. The trail is not groomed for cross-country skiing and skiers do not need a trail pass while using the trail. Snowmobiles are permitted on the limestone section of the trail only and share the trail with skiers, snowshoers, and hikers. The Military Ridge State Trail connects to numerous miles of county snowmobile trails. Pets are allowed on the trail but pet owners must have their pet on a leash 8 feet or shorter, at all times and pick up after pets.